An all-natural way to improve water clarity that's completely safe for fish, people and animals. 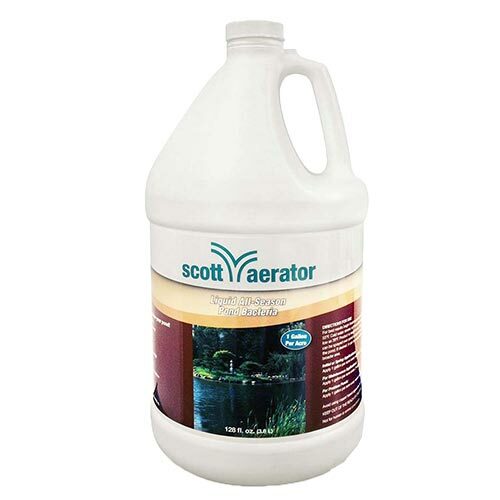 This blend of beneficial liquid bacteria removes ammonia, nitrites, nitrates, and phosphates while simultaneously reducing sludge and muck buildup. All-Season Pond Bacteria helps eliminate nasty pond odors while helping you to maintain a healthy, balanced ecosystem. Comes ready to use and can be sprayed over the pond surface or applied at several spots around the pond. For initial or spring applications, use 1 gallon per acre every week for 4 weeks. Then, for maintaining your pond, use 1 gallon per acre every 2 weeks. Product works in water temperatures as low as 38° F.